It's finally time to unpack and display the Thanksgiving decorations. 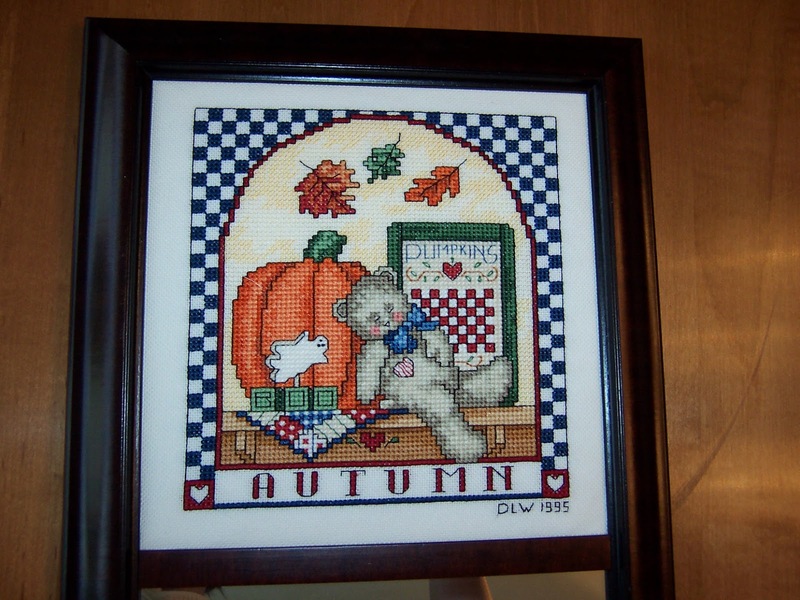 Over the years, I've hand stitched more than a few autumn and holiday samplers and decorative items, mostly counted cross stitch projects. Most of my autumn projects in the past two years (like the fabric pumpkin) have been machine embroidered. 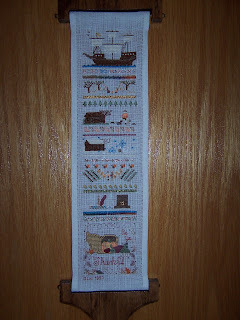 Good: "Bountiful" - counted cross stitch sampler kit from The Trilogy - completed in 2003. 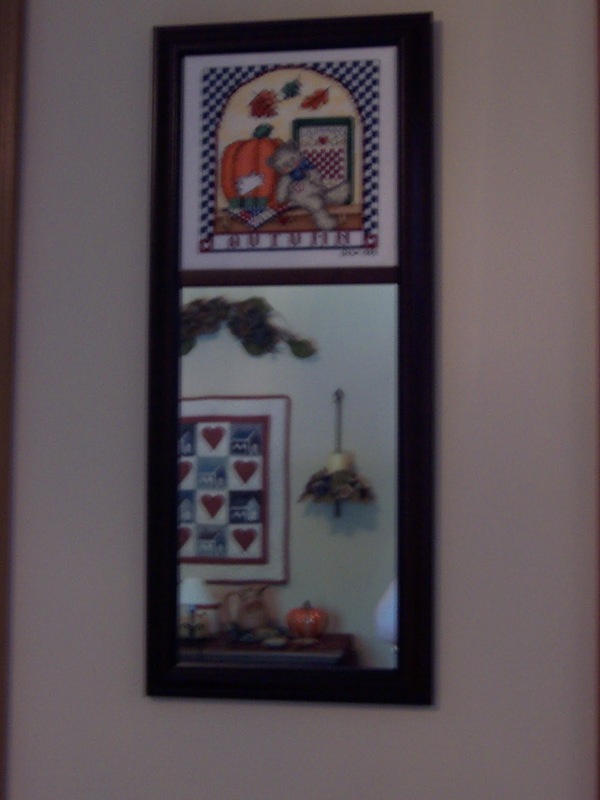 I originally purchased the kit at the CATS festival in Hershey in 2002. 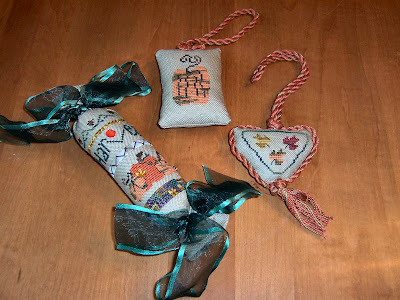 (Update: Sadly, there is no longer a CATS festival but there is a Stitching Jubilee beginning in October 2008). 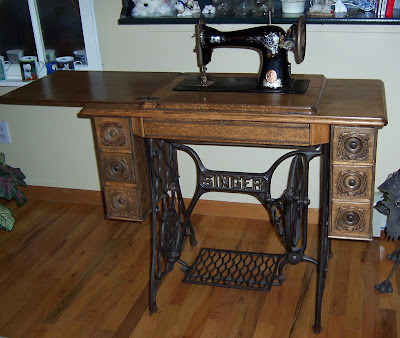 This is stitched on 32-count vintage linen and features overdyed threads from Weeks Dye Works and The Gentle Art. 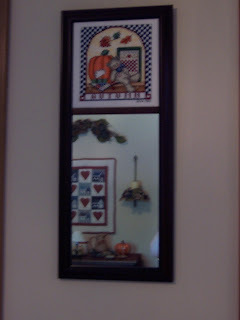 It was framed by Where Victoria's Angels Stitch in Clifton, NJ. Good: "Fall Fobs"- counted cross stitch designs from a Heart in Hand leaflet- completed in 2000. These were stitched on 28-count sage jobelin evenweave fabric using Weeks Dye Works floss and Mill Hill Treasures and beads. After stitching, these were hand-sewn, stuffed and the twisted cording was hand-stitched in place. I used Caron Watercolors thread to make the twisted cord and tassels, which I learned how to do correctly at more than one EGA program. What was I thinking??? I stitched these back in the early 1990's and obviously I didn't have any idea how to make twisted cord properly or how to assemble an ornament and hide the construction. Everything is glued together with Fabri-Tac. 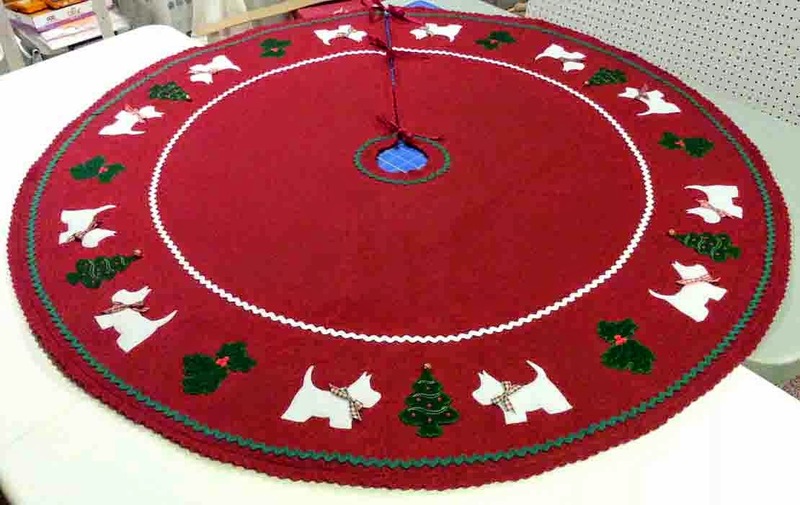 I was a self-taught cross stitcher, had never taken a needlework class, and back then I hadn't heard of EGA either. I think these were made before I signed up for my first AOL account, so the resources of the internet weren't even available to me yet. This was my first attempt at stand-up figures. I used a faux suedecloth for the backs and lined the fronts with muslin before machine sewing the pieces together. But I still didn't really understand how to attach the bottom support pieces. 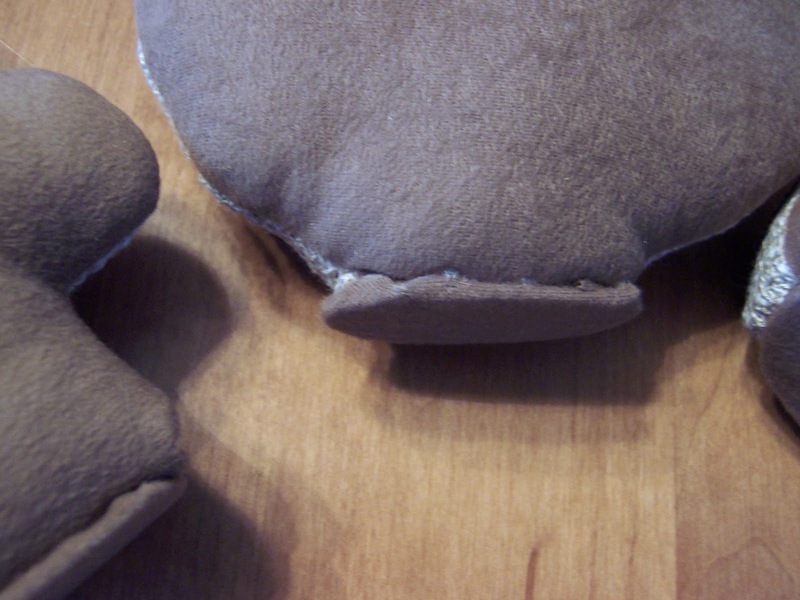 At least these are hand sewn, not glued! I also did not add any weight, so although the two pilgrims stand up okay, the turkey falls over *all* the time. One more time -- what was I thinking? I really needed a much larger base for the turkey. Compare these to the Scared Crow figure I finished this year . . . what a difference! 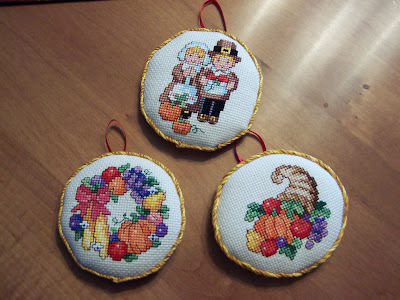 Good: Be Ye Thankful Sampler Bellpull, chartpack from A Stitch In Time. 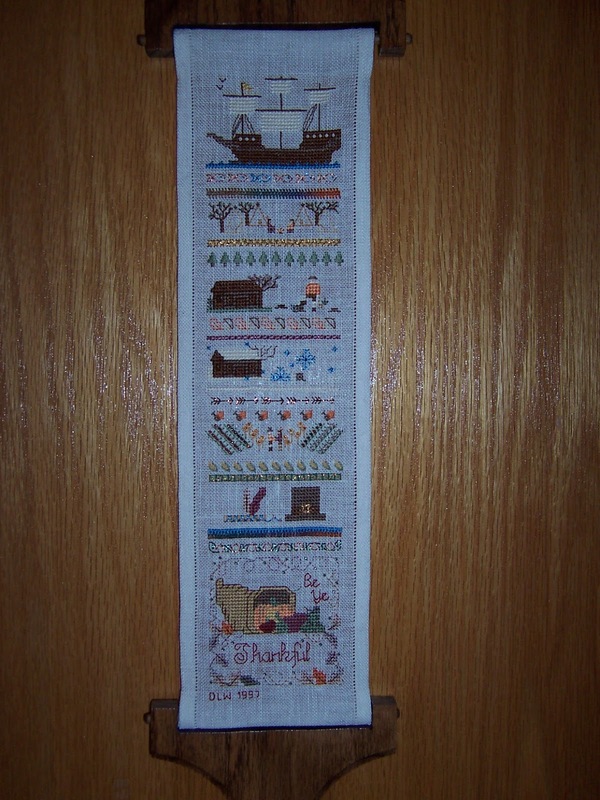 This is a band sampler that tells the Thanksgiving story using bands of counted thread stitches. I completed this in 1997. 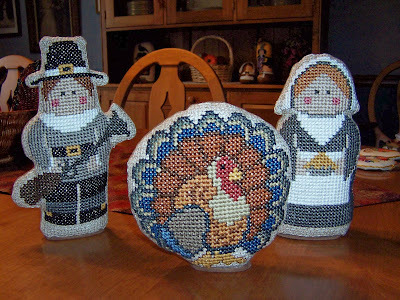 The long sides are hemstitched -- which is one of the first classes I attended at the Spirit of Cross Stitch Festival. 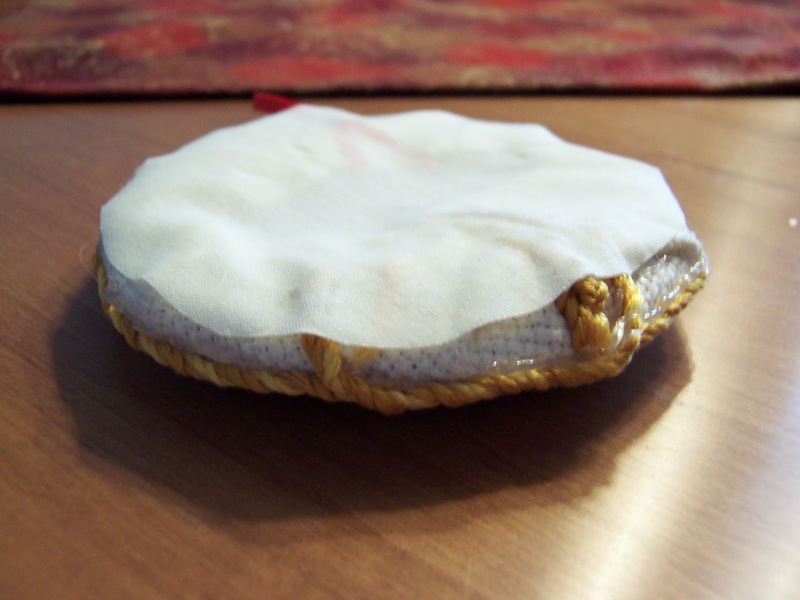 I had taken a class on lacing and pinning needlework for framing, and I have to say, they have held up quite well over the years. Now I change out the different pieces with the seasons.